UPDATED: Tue., Aug. 6, 2013, 5:12 p.m.
More protests and human blockades by Nez Perce tribal members threaten to stall the shipment of massive oil field equipment - called a megaload - across U.S. Highway 12 in Idaho. Nineteen people were arrested and released for disorderly conduct as they blocked the equipment early Tuesday morning. 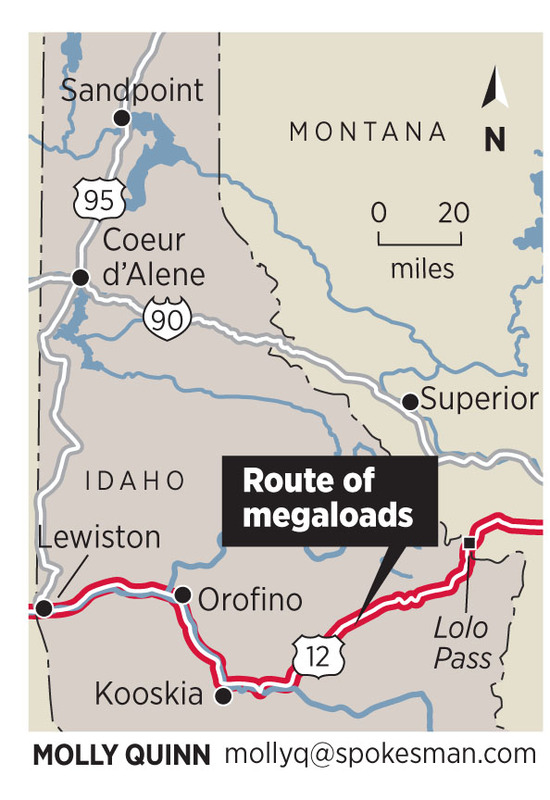 The megaload, operated by Oregon shipper Omega Morgan, is now parked in the median of U.S. Highway 12 inside the Nez Perce reservation. Drivers are expected to resume transporting the 225-foot long, 644,000 pound piece of water purification equipment Tuesday night. The protests have remained peaceful: It was tribal police who arrested tribal leaders. “This is the first of many we are organizing. It’s not over by a long shot,” tribal chairman Silas Whitman told the Lewiston Tribune on Tuesday. Helen Yost, a spokeswoman of environmentalist group Wild Idaho Rising Tide that joined tribal members in their protest of the shipment, monitored activity on social media and through media reports. She also spoke with several protesters at the scene as they returned to their homes around 4 a.m.
About three-quarters of the assembled protesters were tribal members, Yost said. Following a news conference at 9 p.m., those assembled formed drum circles in the parking lot of the Clearwater River Casino about 7 miles northeast of downtown Lewiston along Highway 12. Photos of the protest shared on social media show the estimated 150-200 people on the scene raising signs and gathering in the roadway. When the truck arrived, members of the executive tribal council seated themselves in front of the truck, Yost said, and all but one member (who was absent on vacation) was arrested by law enforcement. A second round of arrests occurred after. “They grabbed an adult who was holding a toddler and tried to lead them away,” Yost said, and the crowd shared their disapproval. Eventually, Idaho State police formed a wedge among the remaining protesters after local law enforcement gave nontribal members an ultimatum of arrest or stepping aside, Yost said. This allowed the truck to eventually move past the protest line. The state issued a permit last week allowing Omega Morgan, a trucking company based in Oregon, to begin hauling two giant water purification units to an oil sands project in Alberta, Canada, despite fresh objections from federal forest managers and tribal leaders. The Omega Morgan megaload left the Port of Wilma at about 10:45 p.m. on its route along U.S. Highway 12. Tribal members prayed and sang traditional songs as the load made its way to the reservation line. Nez Perce Tribal Executive Committee members stood at the front of the group, and indicated their willingness to be arrested. “We might be incarcerated. We’ve accepted that,” NPTEC member Brooklyn Baptiste said. At a news conference earlier in the evening, Nez Perce Tribal Chairman Silas Whitman said talking, collaboration and diplomacy had failed. “We are tired of being pushed,” Whitman said. Whitman and other executive committee members outlined the reasons behind their opposition during a news conference at the casino. They ranged from environmental justice to tribal sovereignty and solidarity with other indigenous tribes. “It’s time for America to stand up. It’s time for America to wake up and see what’s happening,” NPTEC member Anthony Johnson said. “As long as they are going to try to come through our land we are going to be here to stop them,” Moffett said. Before the load arrived, Interim Tribal Police Chief Daniel Taylor said it was his officers’ job to uphold the law. Tribal police had options that included asking people to leave the road, issuing citations or making arrests. “It’s understood by our tribal leadership we have a job to do,” Taylor said. Tribal member Patricia Carter-Goodheart of Lapwai said she was willing to be arrested, and she already had plans for making bail. “I’m in complete opposition to megaloads because of the environmental impact of the tar sands project in Canada,” she said. Carter-Goodheart also said it is a lie that megaloads create local jobs, because the jobs are temporary. She also worried that the loads could fall into the river and damage the region’s delicate ecosystem. Earlier in the day, Nez Perce-Clearwater National Forest Supervisor Rick Brazell made a last-ditch effort to convince the company to stand down. “The Forest Service does not consent, approve or otherwise authorize Omega Morgan to transport the subject over-legal loads on U.S. Highway 12 between (mileposts) 74 and 174,” he wrote in a terse letter Monday to Omega Morgan President and CEO John McCalla. Megaloads have a short but controversial history in the region. A subsidiary of Exxon/Mobil spawned controversy, protests and lawsuits when its intentions to ship more than 200 massive loads to the Port of Lewiston and truck them to oil sands in Alberta, Canada, became known in 2010. Those plans largely fizzled, but the few loads that made the trip took weeks to complete the journey. Because of delays associated with the lawsuits, the narrowness of the road and its difficult winter weather, the company abandoned its plans and shipped the loads via another route. However, a lawsuit filed by Idaho Rivers United that challenged the Forest Service’s position that there was nothing the agency could do about the loads continued. In February, federal Judge B. Lynn Winmill sided with the environmental group and said the Forest Service and the Federal Highway Administration have authority to review and regulate the Idaho Transportation Department’s issuance of oversized load permits for loads that pass through national forest land. Since then, Brazell has looked to establish a process for his agency to review the permits and said a study is needed to identify and describe the “intrinsic values” that could be affected by the shipments as they pass through the Wild and Scenic River Corridor. Until the study is complete, a process is established and consultation between the agency and tribe occurs, the agency said it would not support any loads that are wider than 16 feet, take more than 12 hours to pass through the forest, or those that require the highway or adjacent vegetation to be altered. The shipment is 21 feet wide and was expected to take two days to cross the forest. Kevin Lewis of Idaho Rivers United said he was shocked the company would disregard the Forest Service and Judge Winmill’s order. “I am appalled at Omega Morgan’s lack of respect for the Nez Perce people, for a nationally treasured river corridor and for the authority of the U.S. Forest Service,” he said. The transportation department issued a news release Monday afternoon informing motorists on U.S. Highway 12 to expect delays of up to 15 minutes. According to the company’s permit, the shipment could be on the highway from 10 p.m. Monday night until 5:30 a.m. today, and it was expected to park at a large turnout at milepost 38.8 near Peck before proceeding eastward at 9 p.m. tonight. It was unclear how far the truck had traveled east Tuesday morning, Yost said. More protests along the route are likely in the coming days, she added. Published: Aug. 6, 2013, 6:57 a.m. Updated: Aug. 6, 2013, 5:12 p.m.